Trying to complete an album of coins — say Lincoln cents or Morgan dollars — can be a daunting and expensive task. But how about building a complete collection of United States coins? Yes — I said a complete collection of all United States coins! Believe it or not, it had once been done! This was no ordinary coin collection — and no ordinary person did it. It took Louis Eliasberg many decades and tens of thousands of dollars to complete his coin collection back in 1950. Even then, he continued pursuing each and every coin made during each year of the rest of his life — right up to 1976. Beyond simply having every regular-isse U.S. coin ever made (as if that wasn’t enough! ), he actually had among some of the finest examples of each coin ever made. Many of his coins were in pristine uncirculated grades. 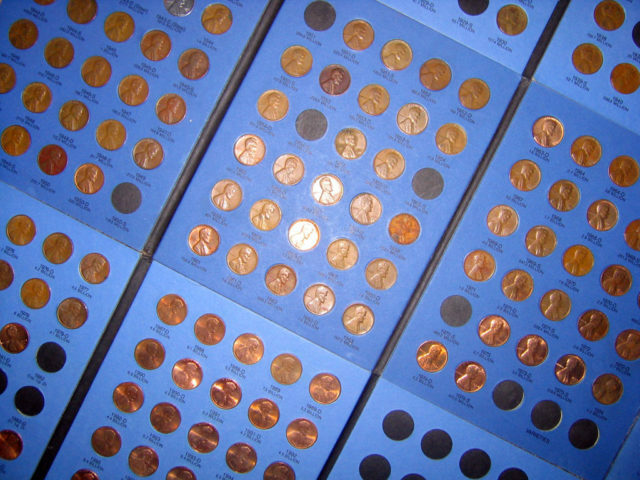 The Eliasberg coin collection was auctioned off in phases during the 1980s and 1990s. How Did Eliasberg Do It? Eliasberg bought existing coin collections over time. His most notable purchase was that of the Clapp coin collection – built by J.M. Clapp and later his son John. Both men had assembled a comprehensive collection of coins in very high grades. After Eliasberg had bought the Clapp coin collection in 1942 for the sum of $100,000, he continued buying coins to fill gaps that the Clapp collection didn’t cover. Imagine the thought of buying coins like the 1804 dollar, 1913 Liberty nickel, and generally lesser-known rarities like the 1873-CC no arrows dime. Even back in the first half of the 20th century, the prices of these coins was nothing to sneeze at! However, over time, Eliasberg did it — he built a truly complete collection of United States coins. If you’ve got dreams of building your own Eliasberg-like coin collection, you need to have lots of money and an even greater ability — the power to persuade museums and estate-owning families to sell their unique coins. You see, along with needing perhaps as much as $50 million or more to do today what Eliasberg did so many decades ago, you need to remember something else: museums have purchased many U.S. coins that may have only 1 to 2 existing specimens each. There are a few different United States coins, like the 1870-S $3 gold coin, that are truly unique — just one exists. Whatever unique or extremely rare coins exist that aren’t presently owned by museums are often owned by families or are in private estates. Even with the money of Warren Buffett or Bill Gates, it can be next to impossible to persuade museums or families to sell certain unique coins. Therefore, building a truly complete collection of United States coins is — dare it be said — virtually impossible today. What Eliasberg did was accomplished in a very different era. Not only did it cost less (even when considering inflation) to do what Eliasberg did, it happened at a time before coin collecting was as popular and widespread as it is now. Coin collecting is more mainstream than ever, and many more people not only realize the value of their coins, but really appreciate owning their coins. Even if it was possible to convince museums and families to sell their extremely rare coins, money is still an issue. Most of us don’t have tens of millions of dollars to spend on coins — or anything else for that matter! But it’s still possible to build a great coin collection that you can be proud to own. Focus collecting the coins you love or are especially interested in. You don’t need to own every coin ever made to have a great coin collection. What makes a coin collection great is that it has the coins you like owning in the best grades and conditions you can afford. Coin collections don’t get built overnight. They can take years and, often, decades to build. Make sure you study up on the coins you want for your coin collection. There are plenty of great coin books and coin websites to help you out. Don’t just buy a bunch of coins without first knowing something about them — how much they cost, varieties and dates to look for, and other important info like that. And don’t forget to protect your coin collection. You’re going to do a big disservice to yourself and your coins if you don’t put an effort into buying safe, high-quality albums or holders for your coins, especially if you own valuable coins.